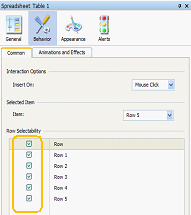 One of the most common requests when using SAP BusinessObjects Dashboards (Xcelsius) is the ability to selectively reset Selector components back to their original state. 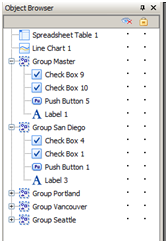 Unlike many other selectors, the task isn’t as easy to achieve with the Check Box component. We can’t dynamically update its Checked/Unchecked status because the changes of the value in the cell that the component is bound to don’t affect the component itself. 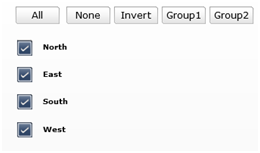 Lack of this functionality also makes it difficult to support updating the statuses of multiple check boxes at once. This post is the first of a series in which I’m going to share my solution to that challenge and examine some of its practical applications. 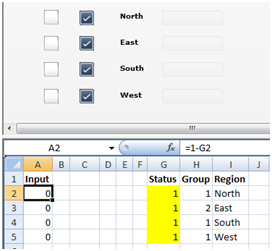 Xcelsius Check Box component looks similar to its Excel counterpart, but acts differently. 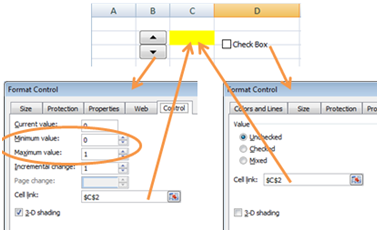 In Excel, the connection between a Check Box control and its linked cell works both ways, as implied by the control’s property: Cell Link. Updating the Check Box status changes the value in the linked cell and vice versa. 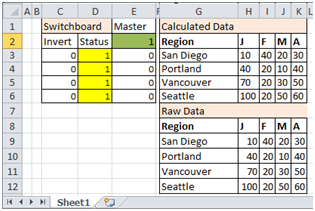 So in Excel, we can dynamically change a linked cell value and see immediate change in the control’s status. That’s not the case with the Xcelsius Check Box component. The hint is in the component’s corresponding property name: Destination. It only assigns the value to the target cell. If that cell is updated by other components, the Check Box component is not notified about the change, and its status stays the same. 1. 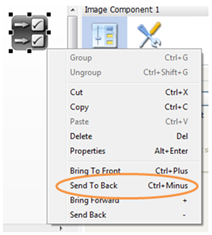 Add a Check Box and a Spin Button control from the Excel’s Form Controls section to a worksheet and link both of them to the cell C2. 2. Set the spin button values range from 0 to 1. 3. When the check box is checked / unchecked the cell gets TRUE / FALSE values. When the spin button is clicked Up or Down it changes values in the linked cell to 1 or 0 and at the same time the check box’s status gets toggled as well. 4. Now, let’s see what happens in Xcelsius. Add Check Box, Spinner and Single Value components to a canvas. 5. Link all of the components to the cell C2 and open a Preview. 6. When the check box is checked or unchecked the destination cell gets values of 1 or 0. But when the spinner updates the value in that cell the check box’s status doesn’t change. This means that in the current version of Xcelsius there is no built-in functionality to dynamically toggle the Checked/Unchecked status of the Check Box component. Luckily, there is a work around. 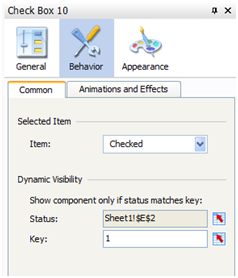 Unlike Excel Form Controls, Xcelsius components have a Dynamic Visibility property. 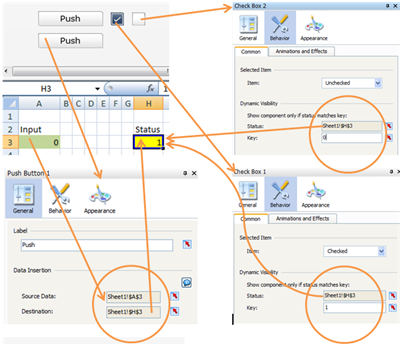 Using its magic in a conjunction with a Push Button component, we can simulate Excel’s check box functionality in Xcelsius. 1. Add two Push Button and two Check Box components to a canvas. We are going to extend the methods described in another post, Customizing a Push Button and combine check boxes and a push button into one custom push button. We also can use the Image Components instead, if we have a pair of good images of a checked and unchecked check box. It makes sense especially if we want to display the check boxes that look fancier than Xcelsius ones. 2. 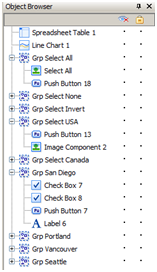 Set Item property of one of the check boxes as a Checked and the other one as Unchecked. Item property is located on the Common tab of the Behavior section. Bind Source Data for the push buttons to cell A3 and Destination to H3. The Excel formula in A3 is =1-H3 and the initial value in the H3 is 1. 3. 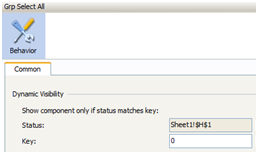 Cell H3 will define the Dynamic Visibility Status property for both check boxes. Set the Key property for the checked check box to 1 and 0 for the unchecked one. 1. One of the push buttons will be displayed as is and the other one will be transparent. 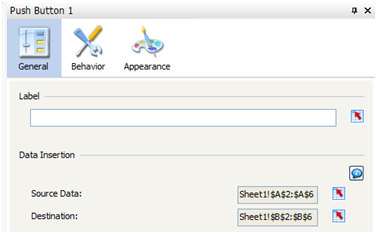 Its Label property should be blank and the Show Button Background property unchecked. 2. Stack check boxes and place the transparent push button on top of them. 3. Add Spreadsheet Table component to see what happens behind the preview. When a preview starts we can see that the check box is checked and the values in A3 (shade in green) is 0 and in H3 (shaded in yellow) is 1. When a user clicks on a check box, the unchecked one is displayed instead, and the values in H3 and A3 get changed to 0 and 1, respectively. 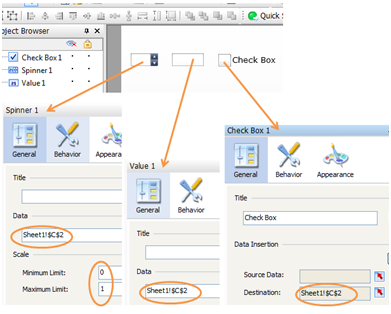 Clicking on the unchecked check box brings the model to the initial state. And, as we remember, the real click happens on the push button, not on a check box. But it’s transparent to a user. 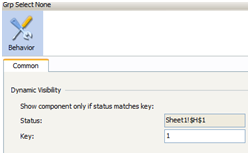 Clicking on the shown push button updates the value in a status cell H3. But this time, unlike out-of-the-box Xcelsius behavior, the status of the displayed check box, from the user experience perspective, is also changed. In reality, we just alternated the display of the check boxes, but a user doesn’t know it (and doesn’t care). This approach allows mimicking the Excel check box functionality in resetting the Checked/Unchecked status of the Xcelsius Check Box component. It also gives us a working model that we can extend to more complex designs that provide rules based dynamic selection of logically grouped multiple check box components. 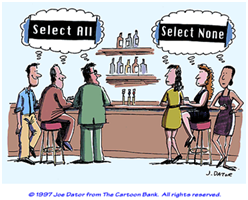 I’m going to show such an example in the Part 2 of this series: Select all or Select none. One of the cool additions introduced in Xcelsius 2008 SP3 was a Push Button component. Now, with just a click of a button, you can copy (push) not only a single cell value, but multiple values in the contiguous range of cells to the destination range of the same size. You can also customize the look of a Push Button component to match dashboard requirements. 1. Add a Push Button component to the canvas and select its properties. 2. 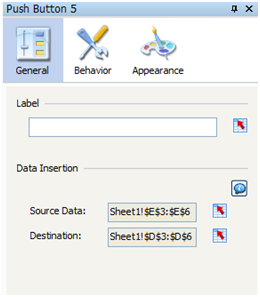 On the General tab clear the text in the Label property and set Source Data and Destination properties as required. For this demonstration I set them correspondingly to the ranges $A$2:$A$6 and $B$2:$B$6. 3. Resize the Push Button dimensions as required by design. 4. Prepare an image file to be combined with the button. To avoid image distortion it should be proportionally similar to the desired dimensions of the Push Button. As an example, I copied from Google images an icon that symbolizes the Select All function. 5. Add an Image component to the canvas and on the General tab click the Import button. Although the label next to the Import button says JPEG or SWF options, Xcelsius also accepts BMP, GIF and PNG files. 6. 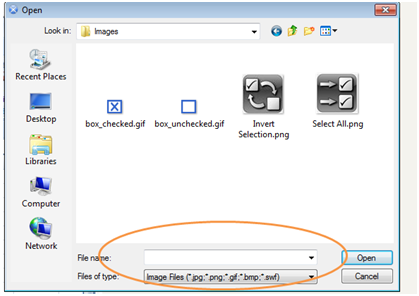 Import the image file and check Resize Image to Component option. 7. If needed, resize both components to the same dimensions. 8. Place the Push Button on top of the Image component. To assure a proper layering apply Send To Back to the Image component. 9. Select the properties of the Push Button component, go to Appearance section and on the Layout Tab drag the Transparency slider to 100%. Alternatively, we can uncheck Show Button Background option on the same tab. 10. To ease maintenance, select both components and Group them together. 11. To visualize what happens under the hood, add to the canvas a Spreadsheet Table component with its Display Data property pointing to the range $A$1:$B$6. Preview on Load before click on a Push Button. Combining a transparent Push Button component with an Image component underneath allows for a customized look and feel of the dashboard, enriching user experience. Over the past several years, in my time at SAP BusinessObjects and more recently with Antivia, I’ve been privileged to witness many dashboard projects at many different organizations around the world. Looking back on these, I realized that aside from the mainstream Business Intelligence principles which most people talk about (e.g. involve the business users, make sure you have a high level sponsor, data quality matters, etc., etc. ), there are also some rather less orthodox principles which help to deliver business benefit through dashboards. 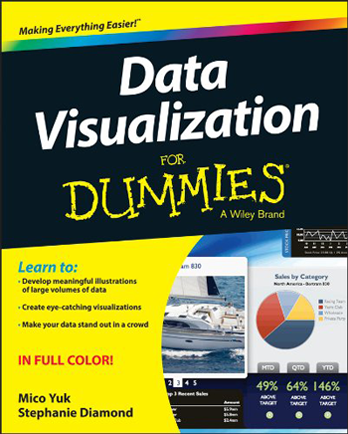 And, they are explained in detail in a new Antivia eBook (registration required). Together, the 5 principles provide a bit of a sideways look at the world of dashboards, and although they might seem a little tongue in cheek at times, each principle contains advice that I believe will genuinely help you to deliver dashboards more successfully and more valuably across your organization. Donald MacCormick is the Chief Product and Marketing Officer at Antivia, an SAP® software solution partner, and creator of XWIS the Xcelsius-to-SAP BusinessObjects connectivity solution. 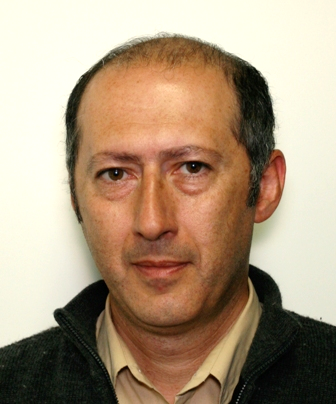 In past years, he was a long term member of BusinessObjects and Crystal, and part of the team that brought Xcelsius into the BusinessObjects portfolio. With the limited availability of scalable data connectivity options for Xcelsius, are you constantly seeking to improve your dashboard performance? If your answer is ‘YES’, then this post is for you. 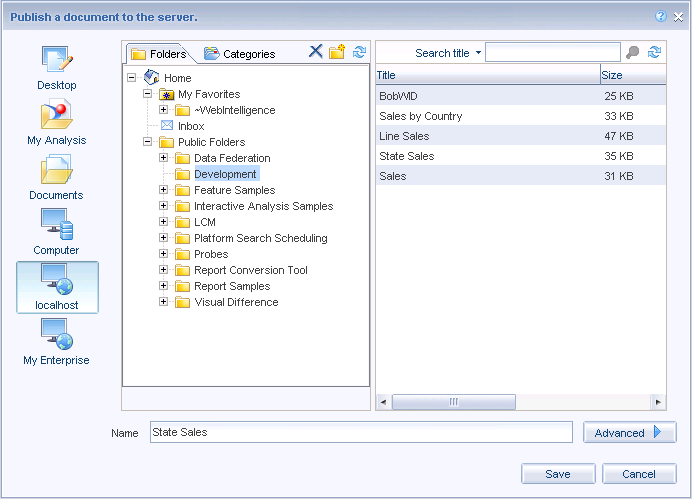 Easily connecting to an ‘Enterprise database’ is a well known problem when using SAP BusinessObjects Dashboards (formerly known as Xcelsius). Let’s refer to it as ‘SCDD’ from here on. Traditionally you have two main data connectivity options, namely Live Office and Query as a Web Service, that is until the release of Business Objects 3.1 SP2 which included a 3rd option named BI Web Services. With BI Web Services (referred to as BIWS going forward), you leverage the web service engine available in Web Intelligence and connect it directly to your dashboard utilizing the QaaWS connector in SCDD. To provide insight into the process, I broke it down into a 2 part step-by-step process that includes screenshots. Keep in mind this was done in a BI 4.0 environment but should work the same in BOE XI 3.1 which is where I originally tested it. 1. Launch the Web Intelligence Rich Client. 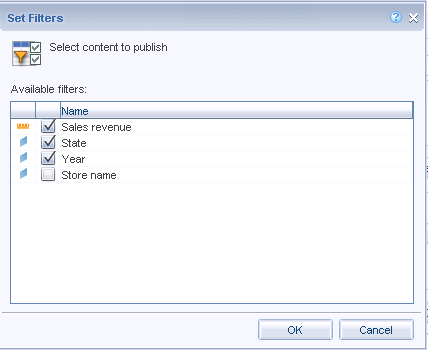 Create your query and basic report. NOTE: Don’t be too concerned with formatting the report at this stage, just make it viewable so that you can review the output. 2. Save and export the report to the CMS. 4. 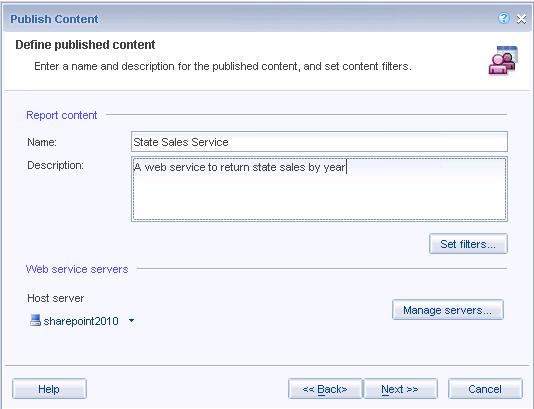 The Publish Content wizard is then displayed. Click Next. 5. Enter the Name of your web service to and click Next. 6. Define the name of the content block, Set your Filters then Click Next. 7. Click Publish, and voila! Your web service is created. 8. Copy the WSDL url and place in a Notepad. 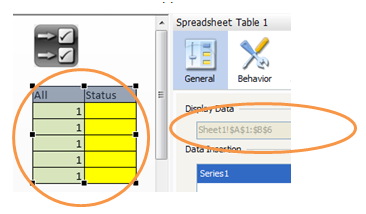 You will need to paste this into the QaaWS data connection in SAP BusinessObjects Dashboards. The next step is to access the web service from your dashboard. 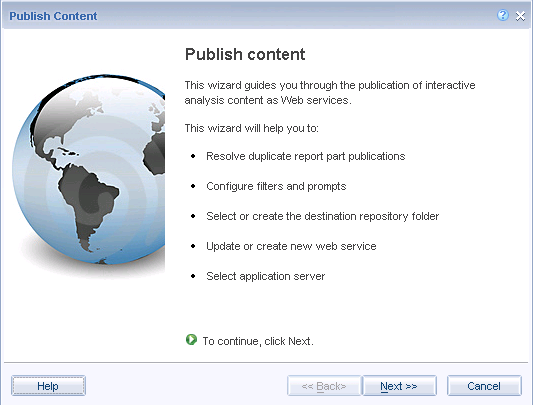 The BI web service is exposed as the same SOAP interface used by QaaWS. 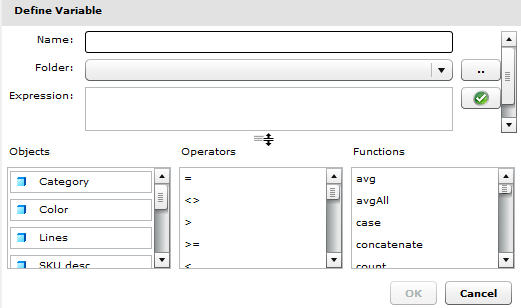 To use the service in your dashboard, you will add a QaaWS connection, Import the wsdl, choose a method and then define the input and output parameters. 1. 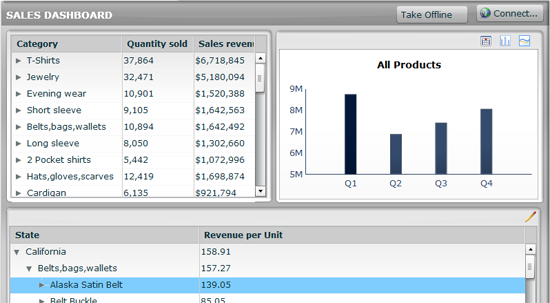 Launch SAP BusinessObjects Dashboards. 2. Open the Data Connection Menu and add a QaaWS connection. Paste URL into the wsdl URL box and then click Import. 3. 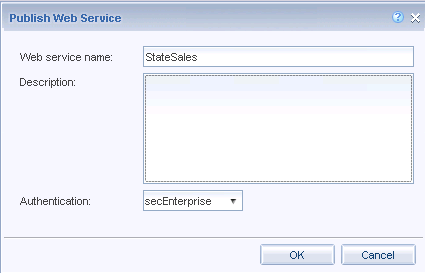 For this example, choose the GetReportBlock_State_Sales_Service from the Method dropdown list. 5. 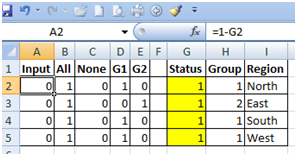 Bind the Header cell value to a single row of cells to hold your report block header. 6. Change the usage to refresh when loaded. CONCLUSION: In reviewing the Connection options, you see that using the BIWS is more powerful than using the basic Qaaws connection. You have two methods to use, one for retrieving the full report block the other is for drilling. We will cover drilling in a future post. TIP: If you want to search for a specific row value, you can set the value to be read from your spreadsheet and bind the operator to the word ‘equals’. There are other options for operator such as ‘greater than’ and ‘less than’. With BI Web Services and SAP BusinessObjects Dashboards you have a lot of flexibility to provide fast and robust data access to your dashboards, hence improving the performance which is your main goal. 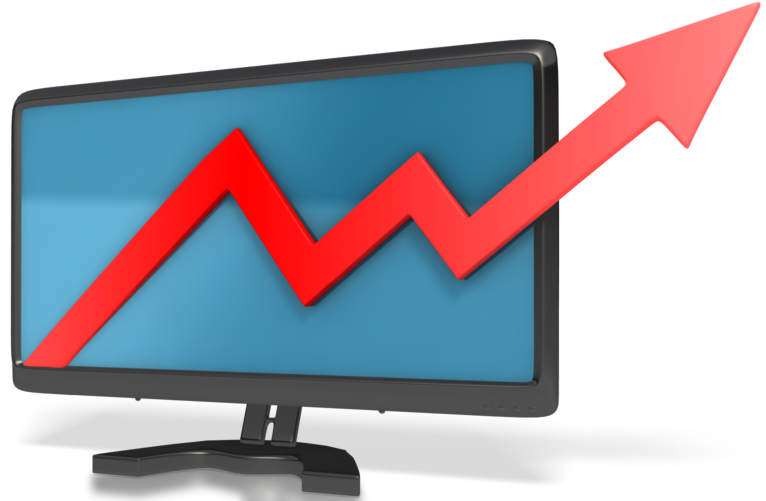 Join Mike Alexander (Author, Crystal Xcelsius for Dummies & Microsoft Excel MVP) and Mico Yuk (SAP Mentor & Co-Founder, Benchmarkers Business Intelligence) on Friday, April 8, 2011, at 1pm EST, for a one hour webinar, titled: “Improving Xcelsius Dashboard Performance“. In this session, Mike and Mico will share some techniques you can use to speed up your sluggish dashboard solutions. We also have a surprise giveaway! So this is definitely a MUST Attend! Also, don’t forget our Xcelsius Advanced Developer Workshop in Miami, FL is less than 3 weeks away. Seats are filling up fast and last year we had a waiting, so register before its too late!